Collection of Guy and Eliane de La Boisselière, Bruxelles, Belgium, until 2018. E.de La Boisselière, Éperonnerie et parure du cheval, Bruxelles, 2005, cat. 211. 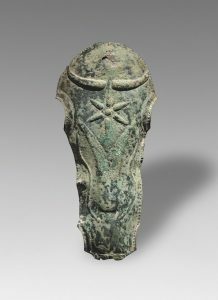 This extremely rare bronze chamfron, or prometopidion, originates from Southern Italy, probably Apulia or Sicily, regions colonised by the Ancient Greeks in the 8thand 7thcenturies BC and called by the Roman Magna Graecia, or ‘Great Greece’. Covering a horse’s forehead, it was one of the most distinctive pieces of equine armours. Together with bronze breastplates, it had the function of both protecting the animal and impressing the enemy, heightening the sense of the warrior’s strength in battle. Few chamfrons have survived intact to this day. 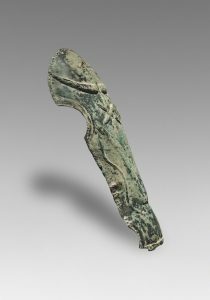 A Southern Italian example, depicting the head of a warrior, and probably intended for ceremonial use, is in the J. Paul Getty Museum, Los Angeles (fig. 1); a second, also Southern Italian, is in the Metropolitan Museum of Art, New York (fig. 2), whilst a third is in the Mougins Museum of Classical Art (fig. 3). Finally, a Greek prometopidion, also depicting a warrior’s head, is in the National Archaeological Museum at Olympia, Greece.